It’s the end of an era that realistically ended a decade ago. On Friday, AOL announced that AOL Instant Messenger (AIM) will shut down permanently on December 15, 2017. When I heard the news, my mind flashed back to the boxes full of America Online CDs in every store, to the dubstep-like beeps and boops of a 28.8K modem connecting to the Internet, and AIM chat rooms providing a real-time connection with people around the world long before social networks accomplished the same task. But the rise of social networks like Facebook and Whatsapp were the final nail in AIM’s coffin. The company acknowledges that the times aren’t just a-changing now that we’re in the smartphone era—they’ve already been altered forever. “AIM tapped into new digital technologies and ignited a cultural shift, but the way in which we communicate with each other has profoundly changed,” writes Michael Albers, VP of communications at Oath (the Verizon brand that gobbled up AOL). AOL discontinued active AIM development in 2012, and cut off third-party apps (like Adium, Trillian, and Pidgin) earlier this year. And AOL Instant Messenger isn’t the only turn of the century vanguard to fall on hard times; Microsoft shut down MSN Messenger in 2014, while Yahoo Messenger closed up shop last year. 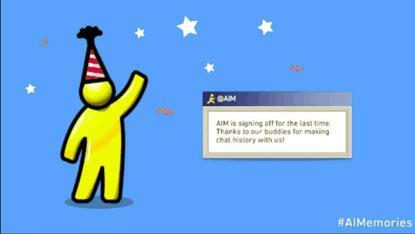 So pour one out for AIM. Who could’ve guessed that AOL’s dial-up Internet business would outlast the one-time chat giant? If you’re looking for an all-encompassing AIM alternative, this handy Chrome extension lets you access Whatsapp, Facebook Messenger, Skype, Slack, Google Hangouts, Discord, Steam chat and more from a single window.